There are many anonymous on-vehicle video uploaded on the Internet. Our technique can estimate the place where the video is captured by learning based approach using random forest. Since our technique uses not only single image, but also several frames, it is expected to improve accuracy than common techniques. In the experiments, we selected 10 cities and tested to show the effectiveness of our method. On-vehicle video localization without GPS is necessary. In our research it is achieved by matching between real data and digital map. To increase the stability and accuracy, space-time feature is extracted from both video data and digital map. Like photo-synthesis, 3D Reconstruction of urban scene can be realized by multiple videos captured by car-mounted video cameras. We make photo-realistic wide-area rendering using billboard represents general shape of urban scene captured car-mounted camera. And also we apply PCA compression technique to texture, reconstruct texture on GPU as faster than faster, implement real-time rendering. We compress the sequence of omni directional image based on IBR(Image Based Rendering), and render a large scale scene in real-time. This operation is all linear, and because we run it in the fragment-shader of the graphics card, real-time rendering is achieved. This research is about generating and analyzing space-time images by fixing the image sequence (video) to a time base direction. Multiple video cameras are set up on the car, and take real world images in various directions. The panorama image is generated by integrating multiple images. Large scale scene rendering is done by IBR/MBR hybrid method using generated panorama images. Efficient image compression technique is also proposed for image based method, which used geometry. Accurate and dense dynamic shape reconstruction technique for underwater environment by projected pattern stereo and Multi-scale CNN. 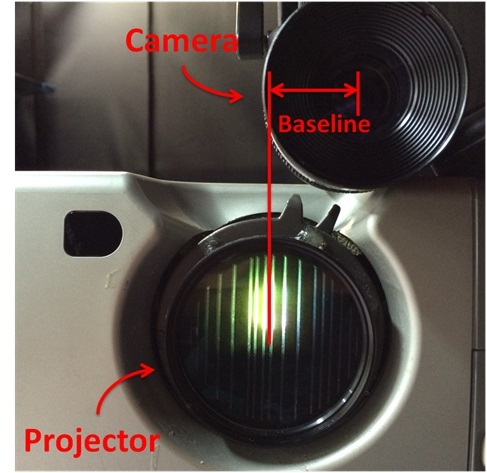 We are developing an efficient and simple calibration method for a projector and camera systems. Gray code version, which requires multiple captures, and an extended version using checker pattern. By analyzing the blurring caused by lens, depth of the captured scene can be estimated. By using high-speed camera with our oneshot technique, 3D shape of objects of fast motion can be captured. Representing the real world object in a PC is available by the proposed 3D acquisition system. 3D acquisition system has being developed, which comprises one camera and projector. Feature extraction for grid-based oneshot 3D scan is improved by a learning-based approach, such as CNN (U-Net). 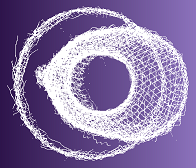 Line scanning results are difficult to apply shape registration because of sparse shape reconstruction. 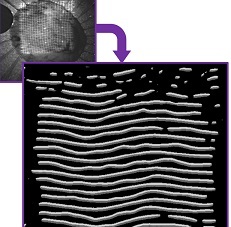 We developed a new ICP method specialized for such line scan. Development of 3D endoscope system using commercial products with our special optical-fiber based laser pattern projector. By using our grid-based oneshot 3D scanning system, non-contact heartbeat / respiration measurements can be achieved. By using multiple cameras and projectors, entire shape of moving human body can be captured densely and accurately without holes. 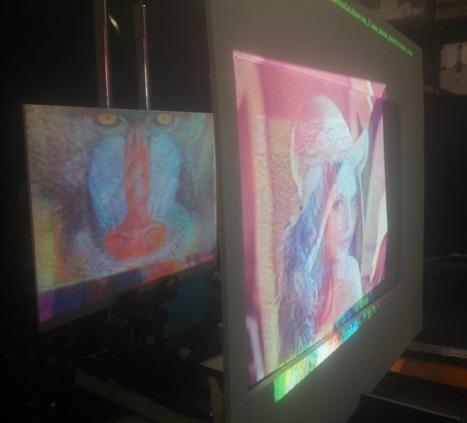 Different images are independently projected to different depths simultaneously using multiple projectors. Image taken with handheld camera occurs blur and includes moving 3D objects. We are developing a Super-resolution method for these condition. All pixels on the epipolar line that belong to the image behind glass will produce the same type of track in the EPI image. Any pixels that are due to reflection will produce a track at a different angle, depending upon the apparent distance to the reflected object. By looking at the color of inconsistent tracks, the reflection can be removed. The separation is applied to outdoor by using the speed correction etc. that consider the difference of the depth using the separation and the block match here. Reflectance parameters (albedo & specular) of real object are estimated from captured images and geometric model captured by projector and camera system. 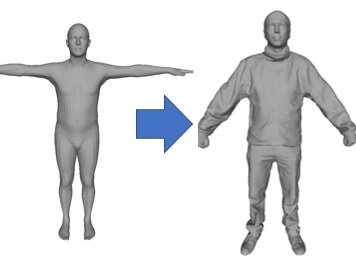 Shape deformations of loose clothes caused by human action are efficiently represented by neural network based regression for sparse bases and their coefficients. The main scenario of this navigation assumes the user to be a bicycler or pedestrian who do not have any smart devices. The system provides several landmarks, e.g., high tower, tall buildings, etc., to follow, leading to reach the final destination. The proposed method consist of three part: (1) Facial parts recognition, (2) Non-rigid deformation tracking and (3) Key point refinement. This research provides system that an individual or small-scale organization can create 3D animation contents even without professional equipment and skill and control 3D animation with gesture operation on tablet device. We propose an efficient tourist route search system that not only recommends a path that simply connects several tourist spots, but also recommends the path with the most beautiful scenery. To achieve an automatic tourist spot recommendation dependent on each user's preferences, we propose a personalized tourist spot recommendation technique using web information. This research is about a system which shows the META information and the hyperlink added to a 3D object on a web page. The system is controlled interactively with a mouse and keyboard. This is a joint research project with Kyoto Sangyo University.